Illinois Connection, the Alumni Association's advocacy network, sponsored a letter writing campaign to ask legislators to support the University of Illinois. At the UIC Flames basketball game on Wednesday, November 20, Illinois Connection, the Alumni Association's advocacy network, along with the UIC Student Alumni Ambassadors, asked students and other game attendees to write letters to their legislators asking for their support of the University of Illinois. Over 120 letters of support were written and will be mailed to both senators and representatives in Washington, DC. Legislative advocacy is vital for the livelihood of the University of Illinois due to diminishing state and federal funding. The university relies on this funding to help prevent tuition increases, support financial aid programs, ensure the appointment and retention of top notch educators, to support research funding, and more. 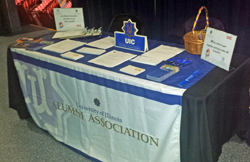 To learn more about the Illinois Connection or to join the network, click here.